The late summer Bank Holiday is on Monday 27th August. Summer 2018 has been exceptionally warm and dry in large parts of the UK but more changeable conditions have returned recently. Will the fine weather come back for the last Bank Holiday before Christmas? Ensemble computer models suggest the likelihood of mixed weather during the Bank Holiday weekend. It is also expected to be relatively cool. 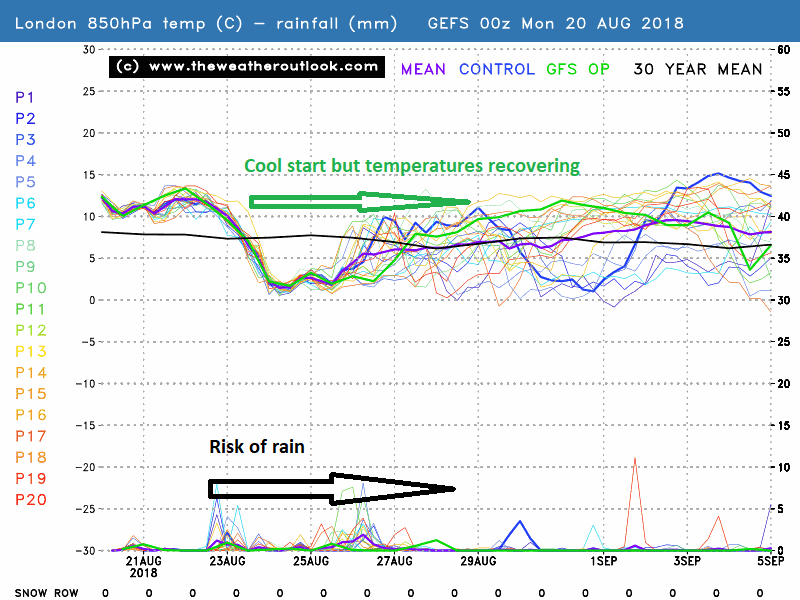 The London GEFS 00z ensemble plot suggests upper air temperatures will be below the 30 year average which would be a marked contrast with much of the summer to date. It suggests temperatures of close to 21C (70F) and a number of runs keep maximum values several degrees lower. Plots for more northerly locations also favour rather cool conditions. On balance Bank Holiday Monday looks likely to be the warmest of the three days. The lower half of the plot shows forecast rainfall. A significant risk of rain is shown on Saturday and Sunday, but a washout is considered unlikely. The ensemble plots for more northerly locations show a similar picture, albeit it with a slightly greater chance of wet periods. 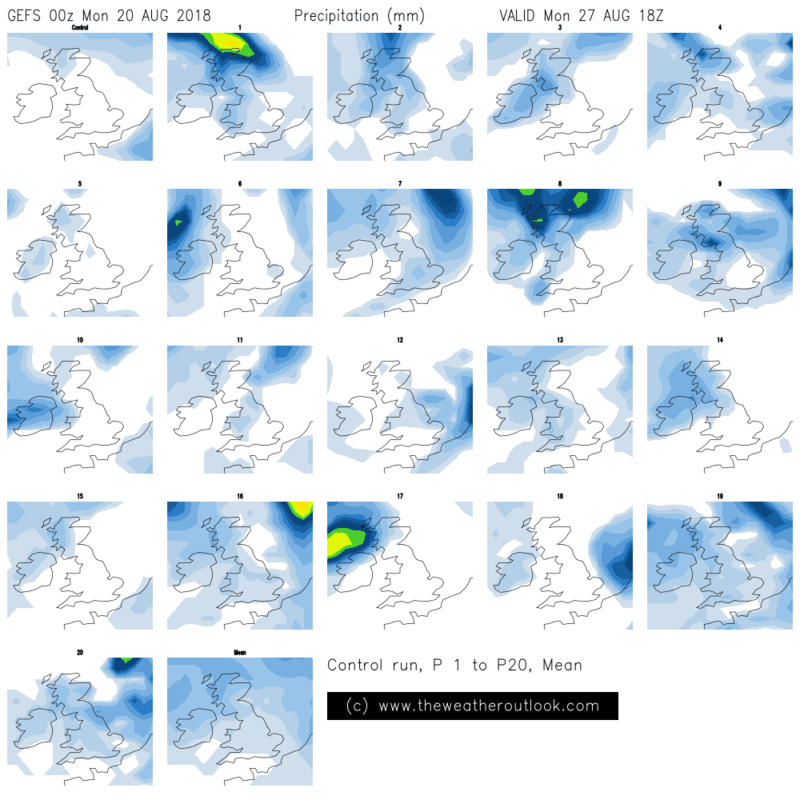 The postage stamp plot below shows the forecast rainfall from each GEFS run on the afternoon of Monday 27th August. It suggests a good chance of dry day in much of the country with the greatest risk of rain in the north west. The GEFS ensemble computer model is indicating a changeable late August Bank Holiday weekend. 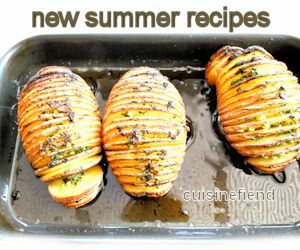 Temperatures will probably be lower than has often been the case this summer. A washout is not expected but all areas could see rain at times.